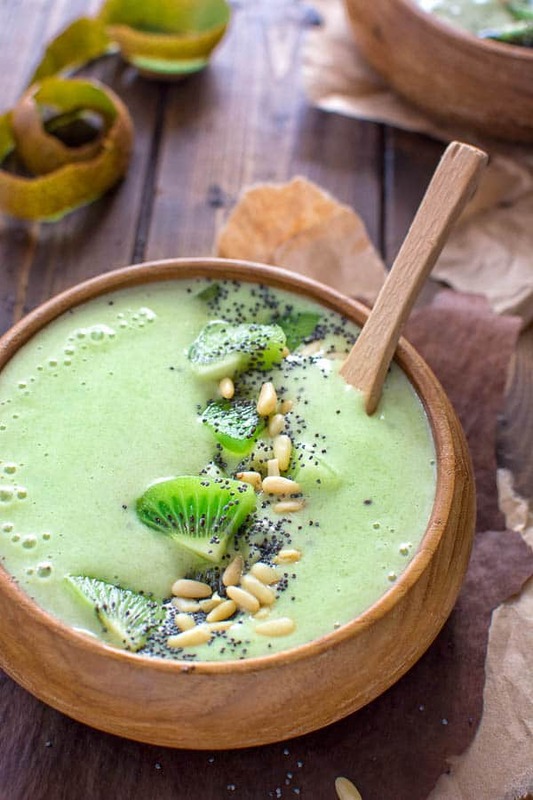 This Green Matcha Smoothie Bowl makes a perfect summer treat. 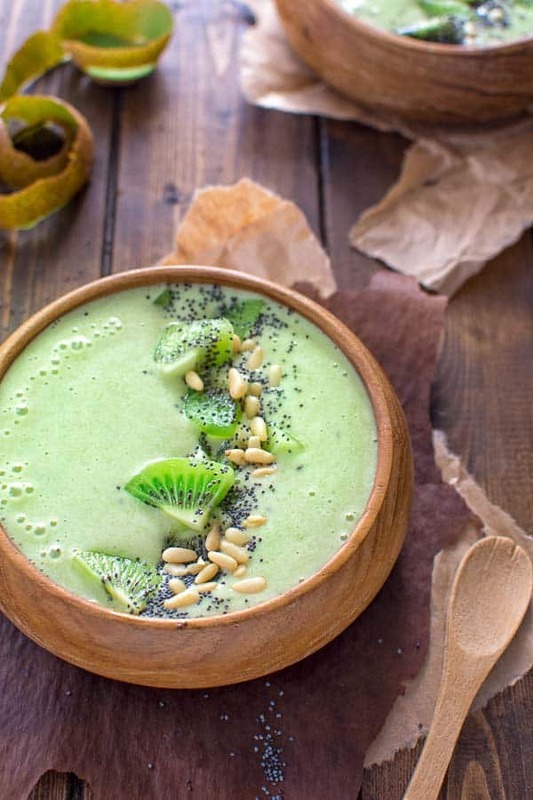 Made with bananas, kiwis, matcha powder and almond milk – it tastes like ice cream and has only 180 calories! 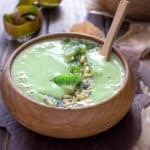 I love everything about this Green Matcha Smoothie Bowl: the ingredients, the ice-cream taste, the texture, the color and the health benefits. And it also looks so pretty!!! I usually make this treat for breakfast, or enjoy it in the afternoon, right after my workout. It satisfies my hunger and craving for sweet, it is low-cal and it has no added sugar. Visit their site for more fun, and very interesting, facts about matcha. When it comes to buying matcha, I found this one from Amazon to be the best and also one of the cheapest. You can also buy it from many health-food stores. Simple, tasty, healthy and refreshing! 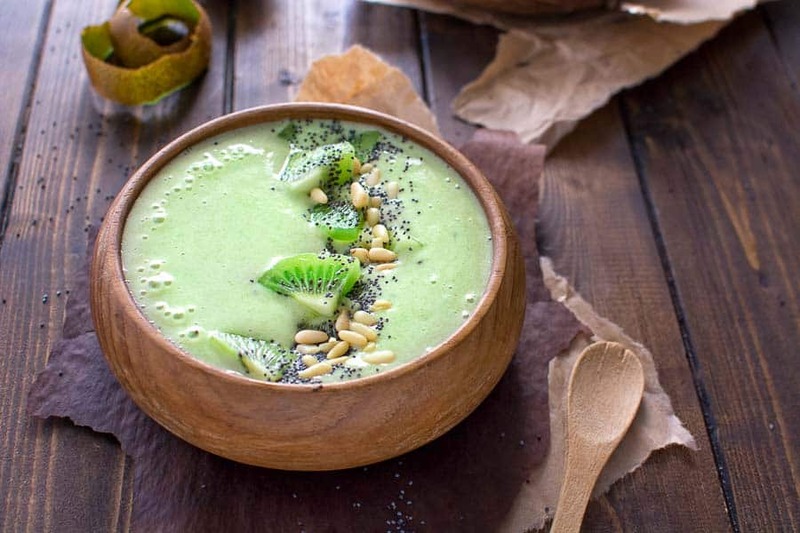 This Green Matcha Smoothie Bowl makes a perfect summer treat. 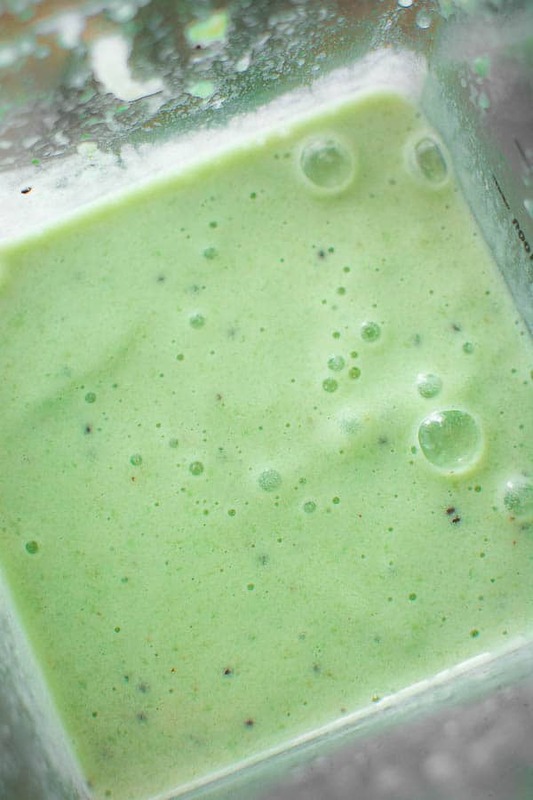 Made with bananas, kiwis, matcha powder and almond milk - it tastes like ice cream and has only 180 calories! 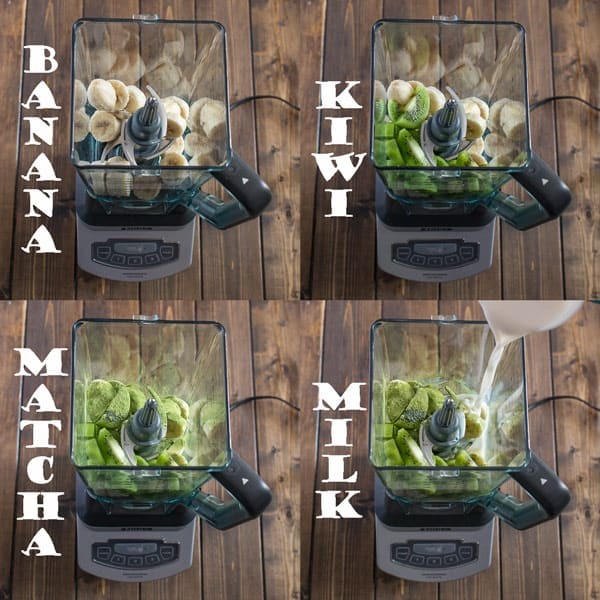 Place all the ingredients in the blender and process until smooth. Divide the smoothie between two serving bowls and top with desired toppings. Possible topping options: bananas, kiwis, berries, almonds, pine nuts, sunflower seeds, coconut flakes, chia seeds, chocolate shavings. I’ve had matcha in the pantry just waiting for a gorgeous looking recipe like this! The vibrant color and oh so creamy texture have me sold 🙂 Can’t wait to try it! love how healthy this is – and if it tastes like ice-cream, i definitely have to taste it! Just bought matcha powder for the first time. This gorgeous recipe is a perfect start! Thanks, Matt! Let me know how you enjoyed the recipe! I keep seeing matcha everywhere and I suppose it’s about time I try it out! This looks like a good way to ease myself into it! Matcha is really tasty and healthy. You should definitely try it, Derek! This is SO pretty! I am still trying to get my tastebuds into matcha. Just haven’t found the right recipe yet. This one looks so good though! Thanks, Trish! I bet you’ll love this one!